Representing dynamic interpretations of the famous Admiral’s Cup Challenge 44, the new Admiral’s Cup Challenger 44 Chrono Rubber models have the wind in their sails. 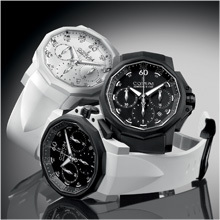 Their vulcanized rubber cases immediately set the tone and infuse the timekeeping functions with renewed vitality. The call of the sea comes in a variety of daring shades. This is clearly no time for a low-key, half-tone approach. The vibrant new COSC-certified chronographs in the Admiral’s Cup collection are brimming with contagious energy expressed through seven new models flying the intense and enthusiastic colors of intrepid watchmaking. One sees red, while the other plunges into the deep blue of the ocean. One is illuminated in white, the other is darkened to black, occasionally opting for the brilliance of a gold bezel… Blue, red, black and white; solid color or two-tone versions; radiating a daring or more classical appearance: the new Corum chronographs love challenges. Their sporty nature is embodied in the velvet-finish matt sheen of their colorful vulcanized rubber strap. While maintaining the collection’s characteristic twelve-sided design and the inner bezel ring adorned with nautical pennants, they display an aesthetic boldness that will appeal to a youthful clientele looking for challenges and differentiation. The dial plays on subtle contrasts to enhance its legibility. Hands, minute numerals, chronographs and chevrons are highlighted by luminescent white, grey or red, ensuring night-time readability. 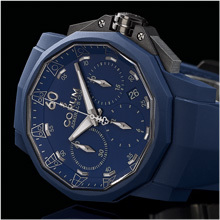 The seconds hand with its Corum key counterweight remains loyal to the spirit of the collection. 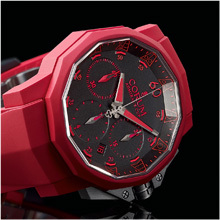 The vulcanized rubber strap in a color matching the case sets the finishing touch to a dashingly vibrant set of models. Loyal companions of intense moments and symbols of a resolutely free-spirited attitude, the Admirals’ Cup Challenger 44 Chrono Rubber timepieces are powered by the mechanical automatic CO753 movement that is chronometer-certified by the COSC. In addition to the hours, minutes and seconds, they display chronograph functions on three counters and a date window at 4.30. Water-resistant to 30 meters for the white versions and to 100 meters for all the others, the case is secured by a transparent back revealing a CORUMengraved oscillating weight that reveals a surprise by adopting the same color as the watch. A fresh breeze is blowing across the flagship collection of the world’s finest regattas… Could it be that today’s challenge also lies in boldness and impertinence?